Most new recruits are not necessarily thinking about their living quarters or medical benefits when deciding which branch of the military to join. To be sure, the best way to decide which branch of the service is best for you is to have a good sense of where your skills and career interests are, and choose based on the opportunities available. The Armed Services Vocational Aptitude Battery (ASVAB) test will help determine each new recruit's best job match. But if you're still torn between two or more different branches of the military, you may want to look at quality of life issues like living quarters, pay and medical benefits. Bear in mind that many of these factors are subject to budgetary constraints and depend on the tempo of any ongoing wars or missions. Housing and Barracks: In the U.S. Navy, the most frequent complaint from new recruits seems to be about the condition of barracks on its bases. The Navy has worked to address this is recent years, but it's worth remembering that it wasn't that long ago that all junior enlisted unmarried sailors who were assigned to live on the ship even when that ship was in home port for months at a time. That meant that a junior enlisted unmarried sailor would have a rack (bed), a few dozen square feet to himself, and not much else. And in most cases, sailors had to share their quarters (not their rack, mind you) with a roommate. To rectify this, the Navy built junior enlisted barracks on many of its bases, reducing the number of junior sailors who live aboard ships. Lifestyle On or Off-Base: When not at sea, the Navy has a fairly good quality of life program that includes family housing, on-base shopping and services, and recreation. Their exchange system (shopping) is considered by many military members to be the best among the services. Like the other services, the Navy converted much of its existing on-base family housing to what's known as military privatized housing. Under this concept, civilian companies are encouraged to construct, maintain, and manage military-only housing complexes on and close to military bases. At most bases, married sailors are given a choice of living in family housing, or living off base at a place of their choosing, with a monthly housing allowance. Sailors who are authorized to live off base at government expense and those who live in family housing receive a monthly food allowance. Those who live in the barracks/dormitories do not normally receive this allowance, but eat their meals for free in the on-base dining facilities. Health Care and Pay: Like all branches of the U.S. military, sailors in the Navy are eligible for comprehensive health care coverage and life insurance. The pay scale for enlisted personnel the Navy, as in all branches of the military, depends on a sailor's rank, or as it's called in the Navy the sailor's rate, as well as his years of service. Sailors can be promoted based on performance, and enlisted sailors have to earn an increase in rate. 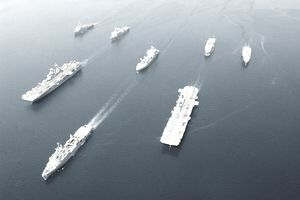 Most sailors can expect to move from E-1, which is the lowest rate, to E-2 after nine months, and from E-2 to E-3 after the next nine months. Promotion from E-3 to E-4 is likely after the next six months.